New Delhi: January 26, 1950 was a momentous day, which seldom comes in the life of a nation. This day our beloved motherland shed the last relic of colonial system and effected a new dawn by becoming a sovereign democratic republic. The first President of India took oath of office and we Bhartiya people heralded a new era for this great ancient civilisation. It has been quite a journey since then. Tomorrow will also be a very special day when the proud nation would be celebrating 70th Republic Day. The main colourful celebration would be held at the historic Rajpath where President Shri Ram Nath Kovind will be hosting President of Republic of South Africa and Supreme Commander of the South African National Defence Force Mr Matamela Cyril Ramaphosa. As per tradition, after unfurling the National Flag, the national anthem will be played with a 21 gun salute. The parade will then commence and the President will take the salute. 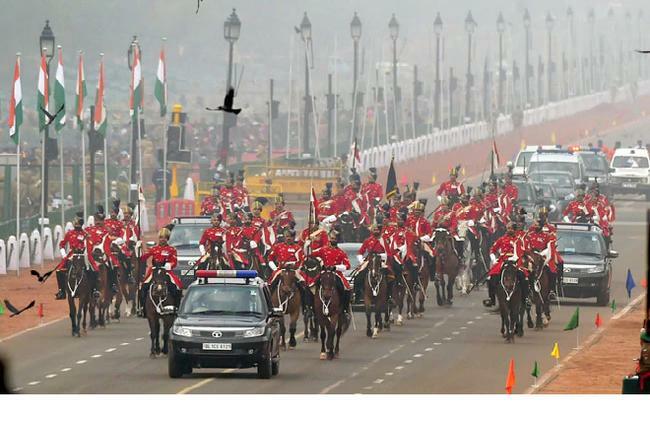 The parade will be commanded by Lieutenant General Asit Mistry, General Officer Commanding, Headquarters Delhi Area. Major General Rajpal Punia, Chief of Staff, Headquarters Delhi Area will be the parade Second-in-Command. The proud winners of the highest gallantry awards will be followed by him. They include the winners of the Param Vir Chakra and the Ashok Chakra. Param Vir Chakra winners Subedar Major & Honorary Captain Bana Singh (Retd), Subedar Yogendra Singh Yadav, 18 Grenadiers and Subedar Sanjay Kumar, 13 JAK Rifles and Ashok Chakra winners Major General Cyrus A Pithawalla (Retd), Colonel Jasbir Singh Raina (Retd), Lieutenant Colonel Jas Ram Singh, (Retd), Lieutenant Colonel D Sreeram Kumar, Naib Subedar (Honorary) Chhering Mutup (Retd), Shri Govind Singh of District Chhatarpur, Madhya Pradesh and Shri Bhure Lal of District Guna, Madhya Pradesh will follow the Deputy Parade Commander on Jeeps. The Param Vir Chakra is awarded for the most conspicuous act of bravery and self-sacrifice in the face of the enemy. The Ashok Chakra is awarded for similar acts of valour and self-sacrifice but, other than, in the face of the enemy. This year veterans of Indian National Army (INA) who fought valiantly against the imperial forces will also take part in Republic Day Parade. They will be Shri Parmanand, Shri Lalti Ram, Shri Hira Singh and Shri Bhagmal.The first contingent in the uniform will be of the erstwhile Gwalior Lancers is 61 Cavalry led by Major Apurva Dabhade. The 61 Cavalry is the only active serving horse Cavalry Regiment in the world. The Regiment was raised on 01 August 1953, with the amalgamation of six State Forces’ Cavalry Units. FlyPast will be led by Advanced Light Helicopters Weapon System Integrated (WSI) ‘Rudra’ and two Advanced Light Helicopters, ‘Dhruv’ of Army Aviation in ‘Diamond’ formation. Assam Rifles will lead the marching Contingents of Para-Military and other Auxiliary Civil Forces. It will be followed by the Indian Coast Guard, Central Reserve Police Force, Railway Protection Force, DELHI POLICE, Border Security Force Camel Contingent, National Cadet Corps Boys & Girls Contingent and National Service Scheme Marching Contingent. Tableau of Gujarat will depict Mahatma Gandhi’s ‘Historical Dandi March’, which shook the foundation of the British Empire by scooping a handful of salt in the coastal village of Dandi in Gujarat. ‘Ray of Hope-Our Composite Culture’ will be the theme of tableau of Jammu and Kashmir. Karnataka will be showcasing Gandhiji’s momentous efforts at the Belagavi Congress session on 26-27 December 1924. Tableau of Uttarakhand will be depicting Spiritual Anashakti Ashram. Delhi will be showcasing Mahatma Gandhi and his association with the national Capital. Uttar Pradesh will showcase Commemoration the 150th birth anniversary of Mahatma Gandhi. West Bengal tableau will highlight two key aspects in the life of Mahatma Gandhi- his stay at Kolkata during the crucial juncture of India’s Independence and his association with Gurudev Rabindranath Tagore. The grand finale of the parade will be a spectacular flypast by the IAF. The flypast will commence with the ‘Rudra’ formation comprising three ALH Mk IV WSI helicopters in ‘Vic’ formation, followed by the ‘Hercules’ formation comprising three C-130J Super Hercules aircraft in ‘Vic’ formation. Behind the ‘Hercules’ formation is the ‘Netra’ the “Eye in the Sky”. Trailing them will be the ‘Sutlej Formation’ which is AN 32 aircraft flying in ‘Vic’ formation. Behind the ‘Netra’ formation is the ‘Globe’ formation, comprising one C-17 Globemaster flanked by two Su-30 MKIs.Next in line will be Five Jaguar Deep penetration strike aircraft, in ‘Arrowhead’ formation. Following the Jaguars are five MiG-29 Upgrade Air Superiority Fighters in ‘Arrowhead’ formation. Three state-of-the-art, SU-30 MKIs of Indian Air Force to execute the Trishul manoeuvre. the culmination of the parade as a lone Su-30 MKI flying at a speed of 900 km/hr splits the sky with a ‘Vertical Charlie’ manoeuvre over the saluting dais. The ceremony will culminate with the national anthem and release of balloons.